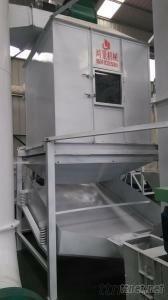 By adopting counter flow cooling theory, pellets can be cooled completely and evenly. Slide value slug clearance hole is used, thus makes the operation stable and makes materials discharge easy and smooth. The temperature of cooled pellet is not higher than room temperature +3-5℃.